The tournament may be crazy. But what's crazier is not having a game plan for when data disasters strike. That's why we're dedicating the entire month of March to helping as many organizations as we can develop disaster recovery plans that work. We call it Backup Madness. Join us for this informational webinar that will help modern SMBs understand how to be prepared for when data disasters strike. CHANCE to win The new apple watch series 4! 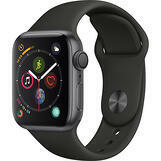 One lucky webinar attendee will win the brand new Apple Watch Series 4 – The largest Apple Watch display yet. New electrical heart sensor. Re-engineered Digital Crown with haptic feedback. Entirely familiar, yet completely new, Apple Watch Series 4 resets the standard for what a watch can be.